So what do we have here? An online ad for a W124 for sale. Somebody found it interesting enough to tweet about it. O.K. 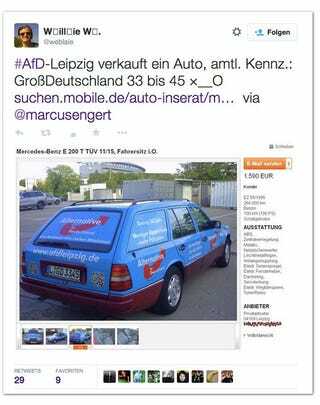 The car is wrapped in vinyl, was obviously used to promote the AFD (Alternative For Germany), a party that wants to get out of the Euro, or something. They currently spend their time fighting among each other if they are anti-islam as well, or who gets to say what. Some people (like me) call them pseudo-nazis in pin-stripes, and this car isn't helping them at all.